Home / YOUR LIFE / HOW TO MAKE THE MOST OF A SMALL GARDEN OR NO GARDEN! HOW TO MAKE THE MOST OF A SMALL GARDEN OR NO GARDEN! Don’t be disheartened by rings of dead leaves around houseplants or shrivelled herbs on the window sill. Following a few simple tips, you can brighten the smallest home with blooming marvellous foliage. 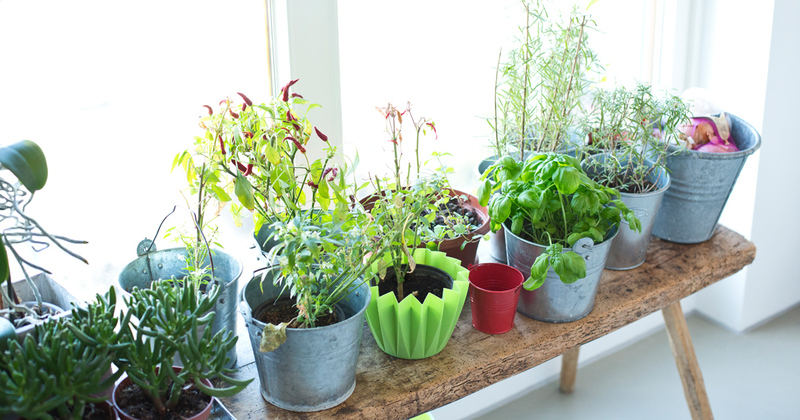 A tiny courtyard, a narrow balcony or a windowsill is enough space for flowers, vegetables or herbs. 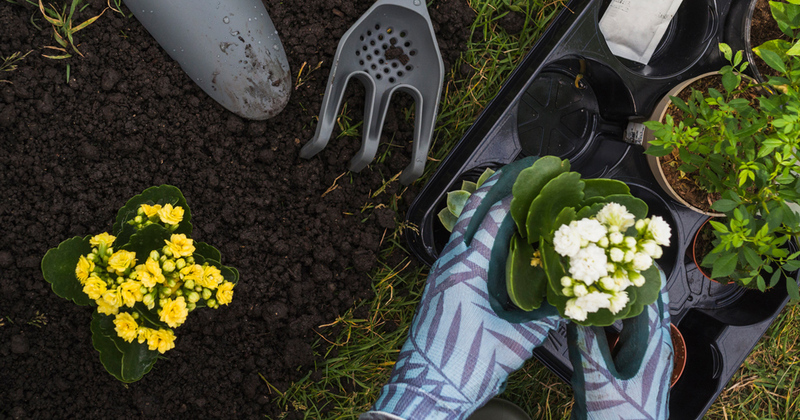 Get a few things right and you’re on your way to green finger status. You can use almost any container – food tins, buckets, flower pots – as long as you make holes in the bottom for excess water to drain out. Place it in a tray to catch the runoff. Pick light colours for outside pots, since dark tints absorb heat that could hurt plant roots. You can always repaint a dark container a lighter shade. Don’t use any old dirt. Good potting soil means better water retention. You can add a slow-release fertilizer when planting veg to keep them happy – ask at a nursery which is best. Whatever plants you buy, keep the tags and check them once in a while to remind yourself what the plant needs. Why not create a feature flower wall, if you have no space for a garden? 1. Wash the tins thoroughly, remove any labels and leave to dry. 2. Use a hammer and nails to make a few small holes in the bases of the cans for drainage. 3. Place them on newspaper in a well-ventilated area and spray or paint each can. 4. Paint each tin with at least three light layers, letting them dry completely in between each layer. 5. If you're using picture hooks to hang them on your wall, make a hole in the side of the dry tins for the hook with a hammer and a nail. 6. Plan your layout on the area you are decorating and nail the hooks to the wall in the desired places. 7. 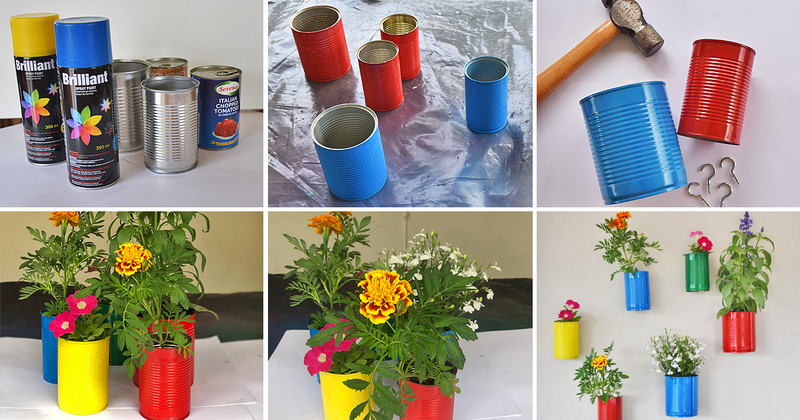 Put your soil and plant in the cans. 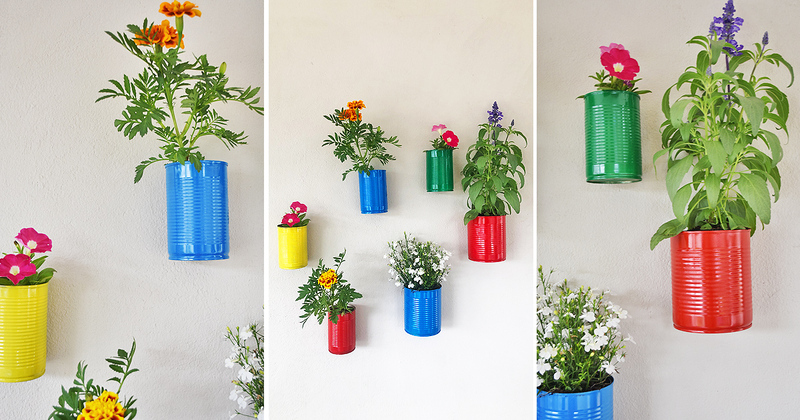 Brush off any excess soil before attaching the cans securely to the wall. Whether it’s for cooking or colour, you can do some pretty amazing things in a small outside space. Measure the pots so you know how many plants will fit and how much potting soil to buy. At home, time how much sun the pots really get. Six hours of direct sun is for “full sun” plants, 3 to 6 is “partial sun/shade” and less are shade plants. When planting, cover the stem to the same level as it was in the nursery pot. Press down firmly to avoid air pockets in the soil. The worst enemy outside is a strong wind, which can topple plants, tear leaves or pull off the fruit. A gentle breeze, though, offers some protection against fungal diseases. Virtually all plants - especially vegetables – hate wet feet. Water carefully, making sure it’s soaking straight down to the roots. Only stop once the water runs out the bottom of the pot. Feed plants every week or two with a liquid fertiliser. Here are some easy plants for a small outside patch. Clivia does well in shady areas, under trees, in containers or on a veranda. Dietes Grandiflora isn’t fussy and will thrive in dry shady or sunny areas. Arum lily prefers damp and shade. Vygies flower beautifully in rock gardens or other dry spots and don’t get too thirsty. Two fun things to try outside are potatoes in a bag or ginger in a pot. Make small holes for drainage near the bottom of any bag that can hold at least 10 litres of potting soil. Roll the sides down halfway and put in a layer of soil in the bottom. Plant up to four potatoes – small ones whole, big ones cut into chunks with a few “eyes” – and cover with more soil. The bag must be in the sun, but stay cool. Water to keep damp, not wet. When shoots come out, cover them with soil and keep doing that until the bag is full, then let the plants flower and die. Shake out your bag and collect your potatoes! Ginger is even easier. Cover a piece in the soil in a pot with the healthiest buds facing up. Place in indirect sunlight, keep moist and wait for sprouts. When you want ginger, pull out the entire plant, cut off a piece and stick the rest back in the soil. 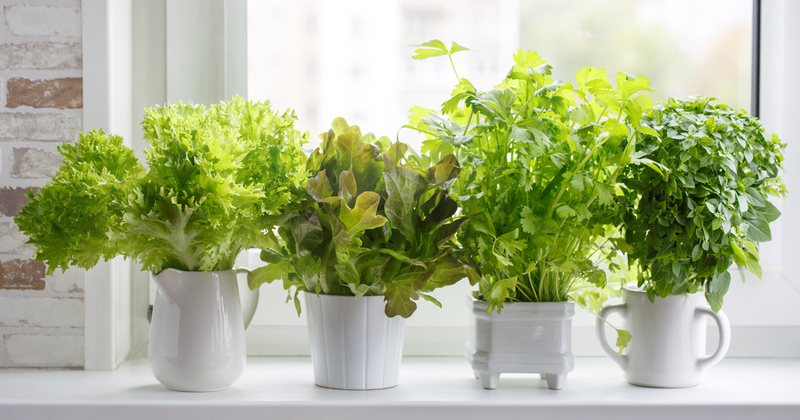 Herbs and salad leaves growing on your windowsill look good and add freshness to your cooking. You can have different salads in one pot, but rather keep herbs in separate containers so you can give them individual treatment. Lettuce and salad greens like lots of light and water every day. To harvest, pull out an entire plant or cut outside leaves. Leave the centre where new leaves will grow. Most herbs need fast-draining soil and less water than typical house plants. Leaves turning yellow means too much water, while cold and drafts can do damage. Start with these easy herbs. Fragrant mint likes moist soil and good light. Its cousin, oregano, craves six to eight hours of sun per day, so pick a sunny windowsill and water when the soil is dry on top. The same goes for watering thyme – don’t let it wilt. 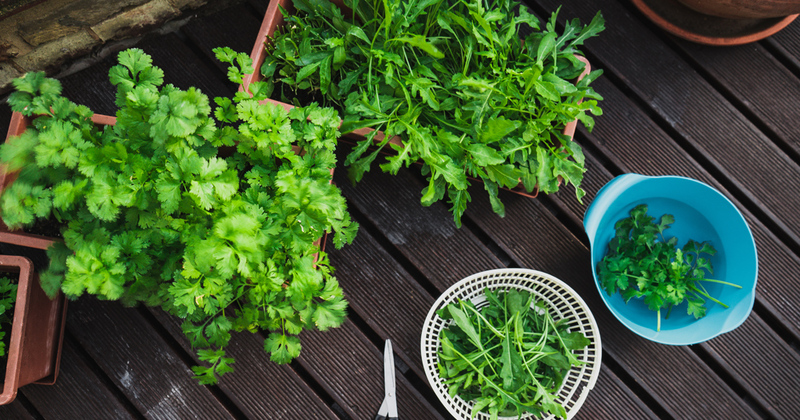 Parsley thrives in a deep pot of rich soil and strong light. It grows slowly, so be patient. Pick an upright variety of rosemary for indoors, make sure it gets strong light and take care not to overwater. Potted indoor plants can have health benefits. The tough snake plant (mother-in-law’s tongue) filters toxins from the air, takes in carbon dioxide and emits oxygen at night. The peace lily gives off enough moisture to boost humidity by five percent, suppressing airborne microbes which can lead to allergies. Succulents are a solid, no-fuss option for indoors. You can use any container, says Sue Both of Garden Guru, as long as they have drainage holes. It makes sense to pick containers that match your décor. If succulents are overwatered, they’ll rot. "Plant them in well-drained sandy soil. Most need full sun and high light.” If they don’t get much, put them outside for a week or two. WHY ARE YOUR HOUSE PLANTS DYING? A plant that goes floppy or pale needs more light. Place it on a windowsill. Don’t move or turn plants unless you have to, so their leaves can turn towards the light. Too much fertiliser can make a plant wilt, with leaves going soft or getting brown tips. Fertilise if a plant stops growing and new leaves are pale with green veins, or smaller than the old ones. Sometimes you get a weak plant that doesn’t make it or you have bad luck – a gust of destructive wind or a pest you didn’t notice in time. Keep at it, be patient and you’ll soon enjoy the rewards of cheerful flowers and delicious fresh herbs or vegetables.